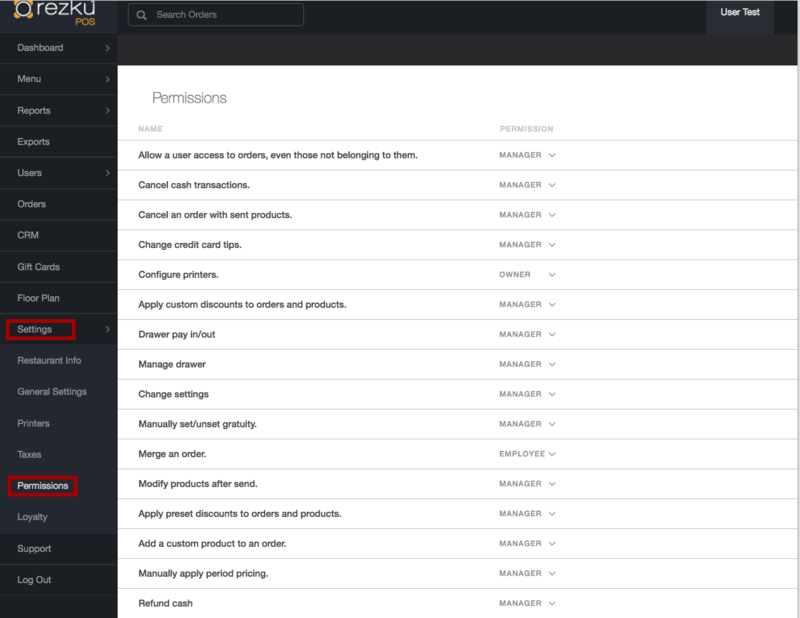 User Permissions are set in the Permissions area of Back Office. There are four levels of permission for Rezku POS. Employee - Employees and higher can perform this action, PIN required. Manager - Only Managers and Owners can perform this action, a Manager PIN is required. Owner - Only the Owner account can perform this action. Allow a user access to orders, even those not belonging to them - Allow a user to modify orders in the Tickets list, even if the order is created by another user. Cancel cash transactions - Permission for canceling cash orders. Cancel an order with sent products - Cancel an order after items have been fired to the kitchen. Change credit card tips - Permission to change tip amount after adding the tips in to orders Awaiting Patron Signature. Change Settings - Access to the Settings screen in Rezku POS (the Gear icon). Apply custom discounts to orders and products - Permission to discount or comp items or orders. Found by tapping the More button and choosing Discount or by tapping the product in the order and choosing Discount. Apply preset discounts to orders and products - Permission to apply named discount presets to products or orders. Drawer pay in/out - Add or remove cash from the cash drawer. Accessed through POS Settings (the Gear icon), under Manage Drawer. Manage Drawer - Permission to use the functions under Cash Drawer Management in Rezku POS Settings (the Gear icon). 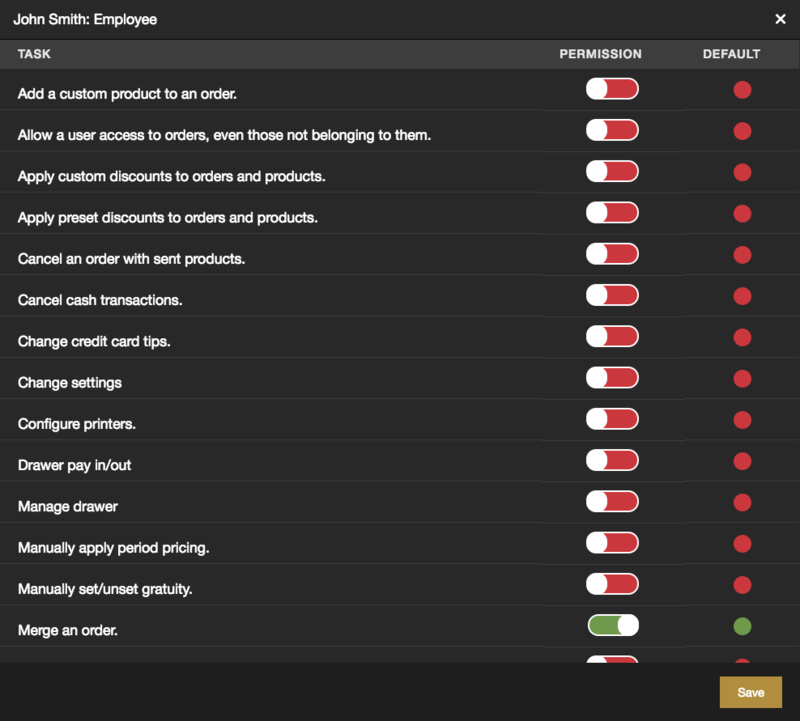 Manually set/unset gratuity - Permission to add or remove gratuity under the More button in the New Order screen. Merge an order - Merge two seperate tickets into one, under the More button. Add a custom product to an order - Permission to use the Custom Product feature under the More button. Manually Apply Period Pricing - Allows you to use of period pricing outside the period. Refund Cash - Allow refunding guests who paid with cash (paying refunds out of cash drawer). Refund Credit Cards - Allow reversing charges for a guests who paid via credit card. Reprint credit card receipt - Permission to reprint the merchant and guest copy receipts. This could be used to forge a higher tip. Set an order as tax exempt - Permission to add a tax exemption for items. Transfer an order to a different server - Change order ownership from one server to another. View product recipes - Permission to view the text added to the item’s recipe in Back Office. 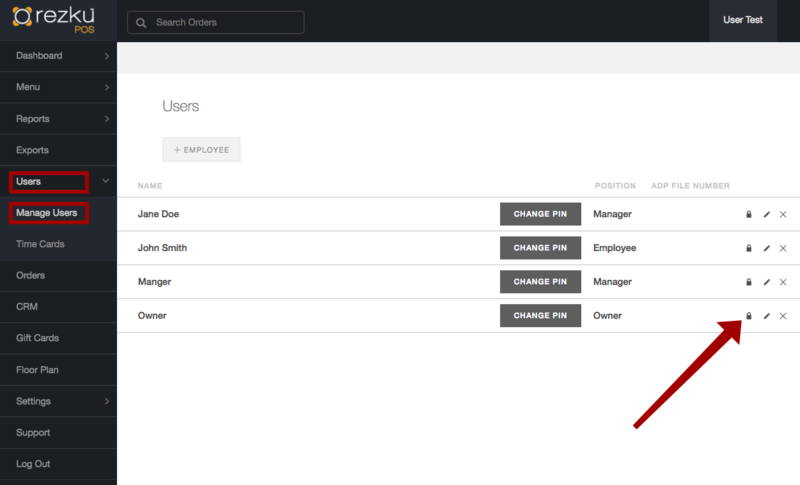 Rezku POS also lets you give or take specific permissions for individual users without changing all of the permissions or changing their role. This lets you assign high-trust employees additional tasks without giving them all manager permissions. To change a user’s permission from the default click one of the toggles. The Default setting is indicated with a red or green dot. Red means the permission is disabled, Green means it’s enabled. Click Save when you’re finished or the X to exit.